Home sales edged up last month, sales for all of 2013 were the highest since 2006, and median prices maintained strong growth through the end of the year. Total existing home sales, increased 1.04% to a seasonally adjusted annual rate of 4.87 million in December from a downwardly revised 4.82 million in November, but are 0.61% below the 4.90 million-unit level in December 2012. New home sales were up 4.44% annually to a seasonally adjusted rate of 414,000. For all of 2013, there were 5.09 million sales, which is 9.1% higher than 2012. It was the strongest performance since 2006 when sales reached an unsustainably high 6.48 million at the close of the housing boom. Overall, housing has experienced a healthy recovery over the past two years. Existing home sales have risen nearly 20% since 2011, with job growth, record low mortgage interest rates and a large pent-up demand driving the market. Despite losing some momentum toward the end of 2013 from disappointing job growth and limited inventory, but we ended with a year that was close to normal given the size of our population. The national median existing home price for all of 2013 was $197,100, which is 11.42% percent above the 2012 median of $176,900 - and was the strongest gain since 2005 when it rose 12.40%. The price for new homes was $270,200, which is 10.48% about the 2012 median of $245,200 - representing the fourth consecutive year of increases. With jobs expected to improve this year, sales should hold even despite rising home prices and higher mortgage interest rates. The only factors holding us back from a stronger recovery are the ongoing issues of restrictive mortgage credit and constrained inventory. With strict new mortgage rules in place, we will be monitoring the lending environment to ensure that financially qualified buyers can access the credit they need to purchase a home. Regionally, existing home sales in the Northeast slipped 1.50% to an annual rate of 640,000 but are 3.2% higher than December 2012. The median price in the Northeast was $239,300, up 3.60% from a year ago. Existing home sales in the Midwest fell 4.30% to a pace of 1.11 million, and are 0.90% below a year ago. The median price in the Midwest was $150,700, which is 7.00% higher than December 2012. 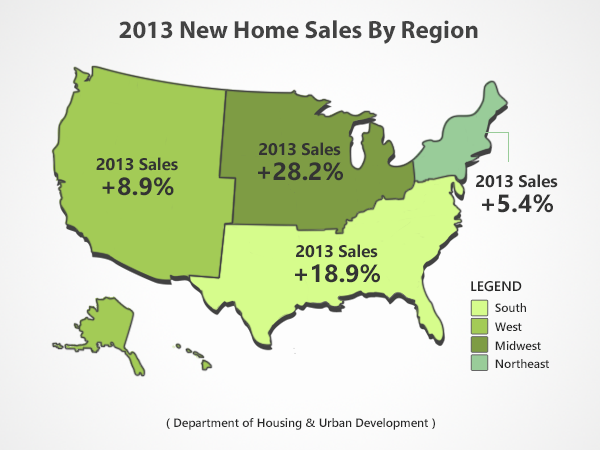 In the South, existing home sales increased 3.00% to an annual level of 2.03 million, and are 4.60% above December 2012. The median price in the South was $173,200, up 8.90% from a year ago. Existing home sales in the West rose 4.80% to a pace of 1.09 million in December, but are 10.70% below a year ago. Inventory is tightest in the West, which is holding down sales in many markets, and multiple bidding is causing it to experience the strongest price gains in the U.S. The median price in the West was $285,000, up 16.00% from December 2012.